Anglesey born actor Celyn Jones talks to us about fulfilling a career ambition, playing Dylan Thomas in the new film Set Fire To The Stars. The film tells the story of Thomas’s first visit to North America, where at the invitation of John Malcolm Brinnin, the director of the 92nd Street Y Poetry Center in New York, Thomas sets out on a reading tour of North American venues. The film focuses on the relationship between Brinnin played by Elijah Wood and Thomas played by Celyn Jones. The film is released in the UK on November 7th. 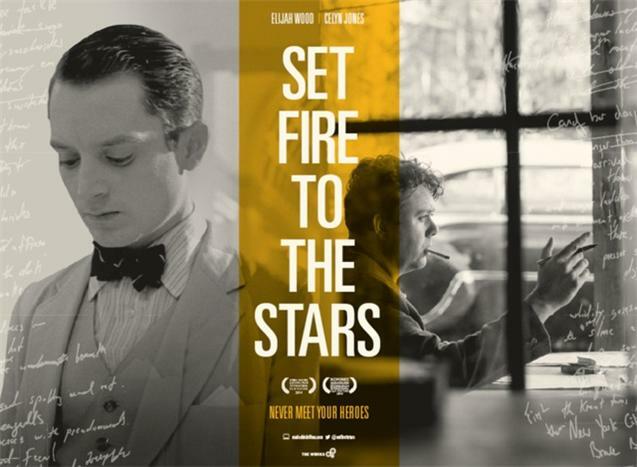 DTN You’ve co-written (with Andy Goddard) and star in, as Dylan Thomas, the new film Set Fire To The Stars, how did the project first begin? CJ Andy and I are great mates. We met through his wife Andrea Dowdall-Goddard, Hair & Make Up Designer, years ago when I was working in the theatre and later he directed me on television and from that moment we were buddies, two film and music nerds with a lot in common and a shared ambition to make something. But with Dylan I suppose it started the moment I wanted to be an actor, experienced his words and saw that famous picture of him with his feet up outside the Vogue studios. I was immediately drawn towards him and his character and his legend and legacy. So after various attempts and near misses throughout my career I finally met up with Andy and we just connected and shared a vision for the story. We knew that if we were ever to make the film it would be his first visit to New York and especially that first week. We probably had 18 months of coffee shop and pub conversations plotting our story and fleshing it out. Then when our brilliant producers, Andy Evans & A J Riach, came on board it accelerated quickly into something very real and before we knew it the script was there, Elijah Wood was on board, Gruff Rhys was writing the music and this incredible creative team were assembling before our eyes to make it happen. DTN What was it like working with a co-writer? CJ Writing is a lonely pursuit and co-writing isn’t. It was great to find a rhythm together, a voice and style. It’s also much quicker together as your first draft feels more like a third as you’ve passed it between each other a lot. Andy had a strong vision and sense of the film he wanted to direct and I suppose my instincts are firstly dialogue and character driven so we’re a nice marriage. No arguments, no fall outs just a bloody great working relationship. I trust and admire him a lot. We’re definitely going to continue a writing partnership and director/actor partnership moving forward. DTN When you were writing did you know that you would be playing Dylan? CJ I was always going to play Dylan and Andy was always going to direct our script. Even if it was just the two of us in a barn shooting it on our phones that was going to be the way. All my career I’ve wanted to play Dylan and felt that I should, people had commented on that too at various points especially when I was performing off-Broadway in New York in my mid-twenties. I had to do it. DTN What was it like playing such an iconic figure? CJ Lots of emotions fly round your body when you embark on such an undertaking, first of all he’s been in my dreams for all my adult life so there’s that to deal with. Yes he’s an icon and he’s our icon so people have a strong sense of him and it’s personal to each person. So you think ok all eyes are on me, all welsh eyes and ears are on me, actors and writers and fans of Dylan will all have an opinion on what i’m going to attempt to do and then…… you breathe and shake all that expectation away and get to work. It’s too heavy to carry all that around so the best thing is to give over to the story, the actors, the crew and director and make the best film we can. It’s the best work I’ve ever done and I’ve left a chunk of myself in Swansea and on screen, let’s just say there’s blood on the canvas. Elijah and I went for a day trip to Laugharne on a day off and we joined Jon Tregenna for a pint at Browns, the reaction from the locals to us for what we were trying to achieve was moving. One bloke put his arm round me and said ‘So pleased you’re playing him and so pleased you’re doing it, Go for it boy.’ that meant the world to Me. People refer to Dylan Thomas as a rock star poet and I agree with that but I also think of him, more so, as the peoples poet – As a man who lived like us and among us, by our side but with the genius ability to condense the universe into few words and a cadence we understand. DTN Has portraying Dylan changed your view of him or given you a different insight into his life? CJ Dylan once claimed he had a beast, an angel and a madman within him. He also carries a lot of legend and sensation with him that can often eclipse his genius work. People can quote his drinking habits as much as his poetry. For me it was about playing the man and all his human and artistic complexities. To show the man drunk and sober and in pain and in love and in awe and lonely and homesick and hilarious and furious and and and. That was key for us, to show a fully rounded character that had the ability to connect with people and to people through his charisma, life force and work. I think more of him now than ever and feel for him even more so. I know how hard it is to support a family by being an artist and how hard it is to be away from them while you do just that. DTN How did you assemble the team responsible for the film? CJ People connected with the script and with the style in which we wanted to make it. Once key members started coming on board they then attracted brilliant people themselves. It would have been different had we been just out of film school and 21 years old. Having been in the game a while and with a body of work behind us, especially in TV, meant we already had relationships with talented people. Edward Thomas (YJB Films) who designed the film said to us when we met him ‘Two things lads: a Dylan Thomas film should be shot in Swansea and a Dylan Thomas film shot in Swansea must be designed by me!’ Ed and his team are amazing and managed to transform the script into 1950’s America. We’ve got world class talent in Wales and who doesn’t want to work with that! Bryn Thomas captured the sound perfectly and Paul and the award winning gang at Bang in Cardiff did wonders with the sound design. VTR North handled most of our post and went above and beyond to complete the piece at the highest level possible with Mike Jones our Editor pulling it all together like an alchemist wizard. And that spirit went on across all the departments, top talent attracting top talent. The film belongs to us all as and it would be nothing without their drive and passion, it is a sum of all its parts. And of course there’s Gruff, my hero. I’ve been a fan of Gruff Rhys’ music from the beginning and have always dreamed of him scoring a film I was involved with. His melody, wit, wisdom and musicality is second to none so there was no choice we just had to ask him. His score is incredible and is the other author on this film, worth the ticket alone. DTN How did Elijah Wood come on board? CJ Honestly we wrote the part for him, sent it to his agent and it resonated with him. I realise it doesn’t always work like that but this time it did and we’re thankful for it. Elijah gives a stunning performance in the film and the story is told through his characters perspective. We just clicked and the chemistry was there which made the work easier and very enjoyable. He works so hard and is so prepared and committed that once the camera is rolling he just effortlessly delivers – great actor, lovely funny man and music nut. Then there’s the rest of this incredible cast too – Kelly Reilly, Steven Mackintosh, Shirley Henderson, Kevin Eldon, Maime McCoy, Richard Brake, Steve Speirs and so on (I want to name them all) who all give superb performances. DTN The film is very beautifully shot in black and white, why did you decide to shoot in b&w? 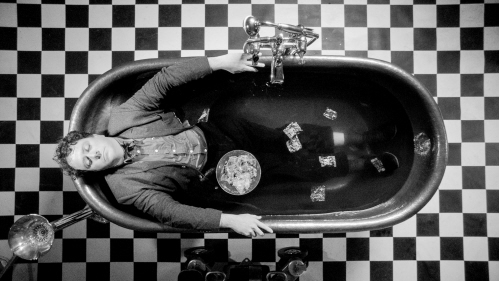 CJ We could only see this story in Black & White, Dylan exists in B&W stills and when we added the elements of New York, Jazz and smoke filled rooms so it just had to be. Chris Seager was our D.O.P. and it’s down to him the film looks so beautiful and dynamic, what an artist. He and Andy painted pictures with every shot which was exciting and meant there was usually a bigger crowd than most gathered around the monitor. So with Chris came a top lighting team who worked like trojans. DTN The title of your film is taken from the last line of Dylan’s poem Love in the Asylum, what made you chose that title? CJ Caitlin and his love for her is a strong theme running through the film and through that poem, I’ve always described that piece as love makes you mad. It’s also such a beautiful poem with some of the strongest imagery and punk lines you’ll find in the English language ‘ A girl mad as birds’ come on that’s great stuff. Andy emailed me when we were looking to title the film and his argument for it went something like “Set Fire to the Stars – I would watch a film called that, buy a book called that and listen to an album called that”. DTN What was your first experience of Dylan’s work? CJ Under Milk Wood as a teenager, I was in a couple of productions in North Wales and at the Manchester Youth Theatre. It’s humour got to me first and then this wave of understanding. At Eighteen my mother bought me an omnibus of his work which has traveled with me since. Fern Hill was the first poem I suppose, boys like that one. DTN What is your relationship with Dylan’s work now? CJ It’s ongoing, like Shakespeare, the more you dig the more you find and above all the more you feel. When you see the film you’ll get that my thing is feeling things first. DTN What are your favourites among Dylan’s works? CJ The film has my big five: If I were tickled by the rub of love, In My Craft or Sullen Art, And Death Shall have no Dominion, Love in the Asylum and Fern Hill. Of course Do Not Go Gentle is fantastic and resonates with so many, this year I was honoured to be asked to read that before the Wales v Scotland Rugby match which was a dream. Then there’s the short stories like Return Journey and the Fight and that beautiful piece about the young boy flying above the town….. I love that one. DTN Would you like to work on other Dylan related projects? CJ Yes I would, perhaps taking one of the stories and adapting it for screen. Something to do with childhood maybe. DTN How do you think Wales is doing in celebrating Dylan’s centenary? CJ I’m very proud of the work that’s come out of wales this year and the centenary and honoured to do my bit. Brilliant theatre productions like Theatr Clwyd’s Under Milk Wood and the Return Journey that’s on now, great art like Sir Peter Blake’s illustrations, bespoke lectures by Hannah Ellis and Jeff Towns, readings, festivals, wonderful local work and of course films in which we are one of them A Poet in New York was excellent and I’m really looking forward to Kevin Allen’s Under Milk Wood adaptation. I think we can hold our head up high as a nation that we’ve done him and the work proud and let us not forget the exciting celebrations happening in New York too which I’m pleased to be a part of, internationally Welsh. DTN What are your next big writing and acting projects? CJ I’m working with the producing team again on a thriller which is very exciting. Andy and I are going to write another script once he returns from his next movie in America and then I’m making the feature Major Goon with Eddie Izzard next year which I’ve written and will also play in. Acting wise there’s a few parts knocking about, I’m part of the Dylanthon in October and the main thing is getting behind the release of ‘Set Fire to the Stars’ to give it the launch it deserves for everyone involved, I hope you all enjoy it.